Ah, the girl's boarding school. It's the ideal setting for a good horror story really. If it's not the very real terrors of tyrannical teachers, or the verbal and physical violence perpetrated by hormonal teens locked away in a regimented environment, then the sheer ambience of an old stately home-turned school should be enough to set the imagination racing to things that go bump in the night. The girls boarding school setting may be a little higher in profile in the public mind a the moment thanks to series three of American Horror Story. 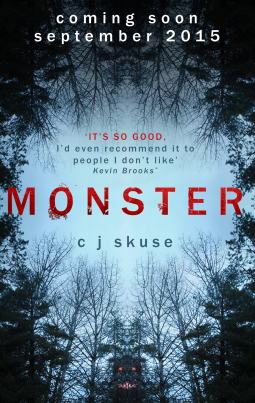 But in 'Monster' instead of witches and ghosts, C J Skuse treats us to a modern tale of isolation, social politics, adolescence... and a large sinister beast roaming the snow covered countryside disembowelling animals and people. It's a tried and tested backdrop maybe, but Skuse is a masterful storyteller whose writing style is bang up-to-date and very accessible for the younger reader. With the emphasis more on the thriller aspects of the story, the horror elements as a result become more mysterious and atmospheric. The book is written in the fist person through the eyes of potential head girl Nash. Her brother is missing in South America, her parents have had to leave her in the old boarding school over Christmas with her rival Diana, her nemesis Clarice, a young “pup” called Tabitha, the “weird girl” Reagan, and her new found ally Maggie, all of whom are under the watchful eye of the school matron until they are picked up by their parents. The book really hooks the reader in the first few pages as Nash spies a beastly shape in the snow that almost hypnotises her. From that point on the plot evolves through Nash's internal monologue and the conversations with her peers, with the occasional grisly death and louche character coming in to add twists. It's a book that does a good job of keeping you guessing until the end, which is an increasingly hard thing to do these days. Skuse is a great descriptive writer who makes small observations and details speak volumes about a character or place. The teenage girls interact and speak as you'd expect a modern teenage girl at a boarding school to do, and their observations will undoubtedly ring true for her target audience. While the well-placed use of humour and wit serves to ground the story nicely. One thing that did stick out in the novel though was the heavy referencing of pop culture. Referencing thing such as Snapchat, Britain's Got Talent, Vernon Kay, and Harry Potter grounds the story quite firmly in the 2010's. But as pop culture can move on quite rapidly, such references may inadvertently date the text so that in five years time, the next wave of readers may find less relevance in those cultural citations. If those references were a little less specific, the time of the story could be a little more vague and enjoy a bit more longevity. 'Monster' is a fast-paced, dramatic, endearing and often tense book that is just as much about the characters as the potential horror lurking around them. As far as young adult novels go, this is a gripping and satisfying read that has everything needed to become a best seller and will endear itself to readers beyond their teenage years.